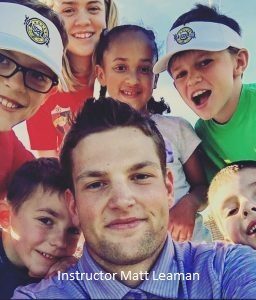 Golf Squad is a wonderful opportunity to share your love of the game with new enthusiastic players in an after school golf program. We handle all the administrative details so you can spend your time focused on teaching. Golf Squad reaches thousands of new players each year and we take that responsibility seriously. Our goal is to grow the sport we love in the most professional manner possible. To do that we must be the golf industry professional’s most reliable partner and offer high quality curriculum designed especially for junior golfers. We value our instructors as much as our students. We really do consider you a partner and work hard for your success. Promote yourself! Go ahead! We want our instructors to get out there in the community and spread the game far and wide. The sport needs you! Not convinced? Fill in a short form and we will contact you. There is absolutely no obligation. Just opportunity! Get Started! Share your love of the game! We work with schools and districts and complete all required administrative and strategic aspects of the offering. We work with PGA / LPGA Professionals to supplement their income and increase their exposure to the market. We encourage our instructors to promote teaching opportunities outside Golf Squad. We find the schools, set up the classes, manage the registrations, create the materials and curriculum, pay for supplies and any school fees and requirements. We really handle everything except the teaching. That is why we need you! Our instructors make the most of any national after school enrichment program! We pay a minimum of $50 to $106 per class hour. Many of our professionals instruct multiple classes per week with top earners making close to $500 per week extra income! We utilize direct deposit and monies are deposited into your account within 5 business days from time of invoice. After you register, the Program Manager for your area, will contact you to see what you're interested in, when you are available and discuss options and any requirements in your district of interest. The sooner you sign up, the sooner we can get you a class! And there is no obligation. This really is a no brainer. We are working with professional associations toward the same goals! Need more reasons to sign on? © 2019, 2011 by Golf Squad LLC. Golf Squad® classes build the foundation to enjoy golf for a lifetime.